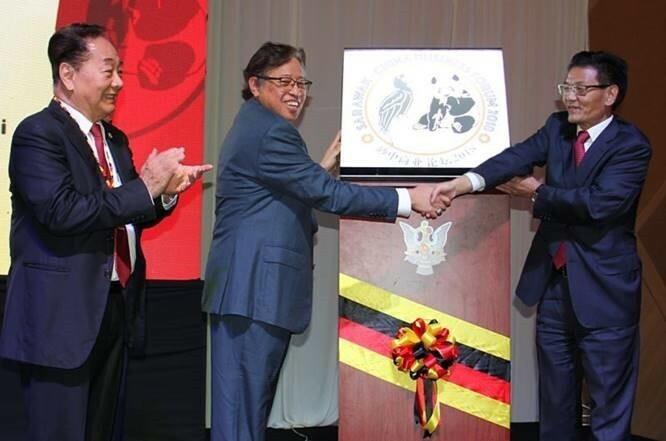 KUCHING: Chief Minister Datuk Patinggi Abang Johari Tun Openg believes that there are opportunities for local entrepreneurs to learn from China in transforming Sarawak’s economy through Digital Economy. He said local small and medium enterprises (SMEs), especially, need to benchmark their businesses against the business model in China in order to be successful in e-commerce, reminding that with online presence, ‘the world is our market with China being one of the largest markets’. He noted that currently, business collaborations between China and Sarawak are mainly in liquefied natural gas (LNG) and petroleum products, palm oil, timber products and electrical components, manufactured goods, machinery and food. “The value of trade between Sarawak and China was recorded at RM15.8 billion in 2017. Sarawak’s export to China was RM10.1 billion while imports amounted to RM5.7 billion in 2017,” he said in his keynote address at the Sarawak-China Business Forum here yesterday. Abang Johari pointed out that Sarawak and China had signed numerous memoranda of understanding (MoUs) on investment, trade and economic cooperation – including with Yunnan Province Department of Commerce, Fujian Province – in recent years to strengthen business collaborations. The most prominent one recently, he added, was with Xian LONGi Materials with estimated investment of RM1.06 billion and Comtec Solar Systems Group Ltd with estimated investment value of RM1.2 billion. “The collaboration between Sarawak and China is not only in the areas of economy and trade, but also covers the fields of tourism, culture and education. “Among them are the Friendship City Agreement between Kuching North City Commission (DBKU) and Dali City; education cooperation between Universiti Malaysia Sarawak (Unimas) and Yunnan University; as well as literary cooperation between Pustaka Negeri Sarawak and Yunnan Provincial Library. “The Chief Minister’s Department also has a MoU with Huawei in assisting Sarawak in digital training and infrastructure,” he said. The Chief Minister stressed that China is a leader in innovations and showcases how digital economy has accelerated its economic transformation, adding that China is now home to some of the biggest names in e-commerce and online retail commerce. He reiterated that China is a strong ally for Sarawak in business as well as cultural ties and the Sarawak government is confident that with China’s support and cooperation, it would be able to realise the transformation of its economy through Digital Economy initiatives. “We are going to integrate friendship and interests together for a better shared future for the new generation. “Sarawak looks forward to more mutual collaborations and partnership, especially on leveraging the digital economy initiatives,” he said. Also present were Minister of International Trade and e-Commerce Dato Sri Wong Soon Koh; Minister of Utilities Dato Sri Dr Stephen Rundi; Minister of Tourism, Arts, Culture, Youths and Sports Datuk Abdul Karim Rahman Hamzah; Assistant Minister of E-Commerce Datuk Mohd Naroden Majais; State Secretary Tan Sri Datuk Amar Mohamad Morshidi Abdul Ghani and Consul General of People’s Republic of China in Kuching Cheng Guang Zhong.